Dow, Nasdaq, S&P 500 all end the session more than 2% higher on the back of upbeat news about China's economy. 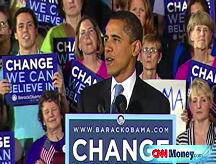 Is Obama's budget too upbeat? NEW YORK (CNNMoney.com) -- Wall Street snapped a 5-day losing streak Wednesday, with the Dow and S&P bouncing off 12-year lows. The markets opened higher and never looked back following reports that China's economy may be improving and as government officials unveiled details of the $75 billion foreclosure fix. The Dow Jones industrial average (INDU) jumped 150 points, or 2.2%. Earlier in the session, the Dow had been up more than 250 points. The broader S&P 500 (SPX) index rose 16.5 points, or 2.4%. The tech-heavy Nasdaq composite (COMP) jumped 33 points, or 2.5%. "China is the 800-pound gorilla, so if they are going to go out and push a lot of money, that set the stage" for Wall Street's rally, said Kenny Landgraf, principal and founder of Kenjol Capital Management. The details to the $75 billion mortgage modification plan were another major spur to the stock market rally Wednesday, according to Landgraf. "We have been hearing about this for some period of time," he said, and "it is finally here - you know what the plan is." Landgraf said that a recovery in the housing market was the key to the recovery in the national economy. Despite the government spending, however, it has been a tough road on Wall Street. On Tuesday, the Dow Jones industrial average and S&P 500 ended at fresh 12-year lows. 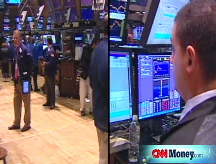 It was the fifth straight loss for the three major indexes. The S&P 500 and Dow industrials are both more than 50% off their all-time highs from October 2007. "Anything that will show that there is a recovery so that future earnings will go up, the market will price that into equities," said Dave Hinnenkamp, chief executive officer of KDV Wealth Management. "There is a lot of ammunition there - it just needs something to ignite it." Hinnenkamp also said that stock markets would not necessarily shoot directly up. The next weeks and months could be volatile. Ed Clissold, senior global analyst at Ned Davis Research, said that he believes that the market is in the process of bottoming out. However, Clissold also said that the recovery of Wall Street would be characterized by volatility. "Today is a good step, but this healing process takes considerable amount of time, especially considering the carnage that we have seen," said Clissold, "so I wouldn't put too much into one day's action." Market breadth was positive. Advancers beat out decliners on the New York Stock Exchange 4-to-1 on volume of 1.80 billion shares. On the Nasdaq, advancers beat out decliners more than 2-to-1 on a volume of 2.36 billion. Aluminum producer Alcoa (AA, Fortune 500) and heavy construction machinery manufacturer Caterpillar (CAT, Fortune 500) led the Dow advance, both up about 13%. Meanwhile, General Electric (GE, Fortune 500) was down almost 5%, as investors feared that the conglomerate with a legendary AAA credit rating may face a downgrade that could push it into a cash shortage and funding problems. China: China said Wednesday its manufacturing activity increased for the third straight month. And Asian markets were also supported by reports that the Beijing government will add to its $585 billion stimulus program. The possible recovery of China's economy could work to bolster sentiment. "Right now, we have a lack of confidence and that lack of confidence really stems worldwide," said Hinnenkamp. He said that stimulus plans really don't have a great chance of working until the tide of consumer confidence reverses direction. The Shanghai Composite Index surged 6.1%. Japan's Nikkei ended up nearly 1%. European markets ended higher. France's CAC index was up more than 4.7%, Britain's FT-100 gained 3.8% and Germany's DAX index was up more than 5.4%. Foreclosure plan: Federal officials announced details of the President Obama's $75 billion foreclosure prevention plan and the program opened for business Wednesday. The foreclosure fix aims to modify home loans so monthly payments are no more than 31% of monthly gross income. The plan will offer incentives to borrowers and loan servicers and investors to help struggling homeowners make their payments. Labor market: Job market data released Wednesday showed continued weakness, but a mixed message about whether there's an improvement underway. Payroll-processing company Automatic Data Processing said the private sector lost 697,000 jobs in February - more than the 630,000 jobs economists were expecting, according to a survey from Briefing.com. Meanwhile, the number of planned job cuts announced in February fell for the first time since December, according to a report from outplacement firm Challenger, Gray & Christmas Inc. U.S. employers announced 186,350 job cuts, down 23% from January's 241,749 cuts, according to Challenger. Investors were bracing for the government's reading on the labor market due out Friday. The Labor Department report is expected to show that the economy shed 650,000 jobs in February, more than the 598,000 reported for January, according to a consensus estimate of economists complied by Briefing.com. The unemployment rate is expected to rise to 7.9% from 7.6%. Economy: A report released Wednesday morning showed further contraction in the service sector in February. The Institute for Supply Management's non-manufacturing index fell 1.3 percentage points to 41.6 in February from the month prior. The drop was not as steep as economists were predicting, however. Other markets: As global equities rallied, government debt prices fell. The benchmark 10-year note was down 25/32 to 98 1/32 and its yield rose to 2.98%. Bond prices and yields move in different directions. Lending rates were nearly unchanged. The 3-month Libor rate rose to 1.28% from 1.27% Tuesday while the overnight Libor rate eased to 0.31% from 0.32%. Libor, the London Interbank Offered Rate, is a daily average of rates that 16 different banks charge each other to lend money in London. Meanwhile, oil prices settled up $3.73, or almost 9%, to $45.38 a barrel. The government's weekly supply report showed that crude stockpiles decreased by 700,000 barrels in the week ended Feb. 27, while analysts expected an increase of 2.2 million barrels. The dollar lost ground against the euro and the British pound, but rose against the yen. COMEX gold for April delivery fell $5.80 to $907.80 an ounce. Looking toward Thursday: The weekly jobless claims report will be released as the market begins to focus in on the labor market ahead of the government's unemployment report due out Friday. The number of Americans who filed for unemployment for the first time was expected to decrease to 650,000 from 667,000 the prior week, according to a consensus estimate compiled by Briefing.com. Also on Thursday, factory orders for January are expected to have fallen 3.5% after having fallen 3.9% in the previous month. In Washington, Federal Reserve Vice Chairman Donald Kohn is scheduled to testify at a Senate Banking Committee hearing on what happened with insurance giant American International Group.